This hack is a complete port of the entire English GBA script for Final Fantasy V.
All text from the game has been ported, edited where necessary to get around the stricter space limitations of the SNES game. I am still currently working to improve this project as much as I can, so any suggestions are welcome. What I want to ask is will only script be ported over or other stuff too? By other stuff I mean new jobs and dungeons, portraits, though there's not much space, but worth asking. And lastly not so long ago there was this hack published http://www.romhacking.net/hacks/3698/ it wouldn't hurt to have same treatment for this iteration, will it be off scope of project? Really not a fan of nonuniform numeral height, honestly. Also, please make sure that whatever method you're using to scale up the font image is set to nearest-neighbor (or no filtering at all), because it's blurry and hard to make a judgement call on as a result. My hacking knowledge essentially amounts to using a text editor and some minor pointer editing, so the non-text content of the GBA version is out of scope. Similarly, I lack the required knowledge/effort to edit the battle sprites. 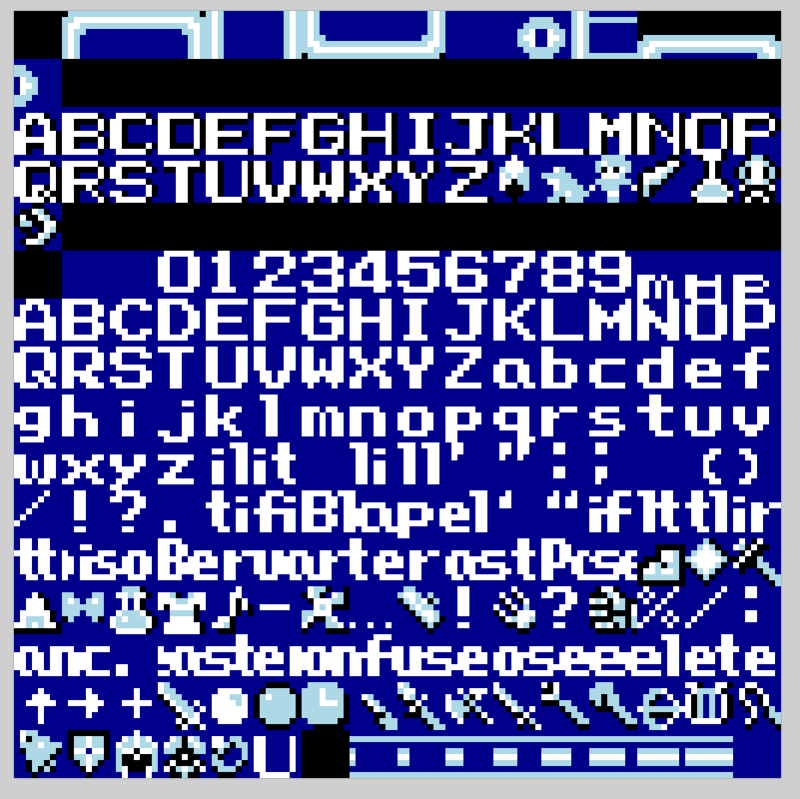 The font you shared (the GBA font) is the one I'm considering using, however I'm currently using a VWF loosely based on FF4's fixed width characters, which is shown in the game screenshots. As for the longer spell names, I've updated most of them using 'squish tiles', however with this method I've hit a bit of a roadblock and don't really have anymore usable tiles, as it seems. As such, most spell names are updated with the exception of, unfortunately, Ice2, Bolt3 etc, as well as a couple of others. Blame Imgur's scaling for that - I wanted to make it bigger but I'll probably just upload the smaller version instead. The question I'm really trying to answer is whether to use the GBA font or the current one, however I'm welcome to suggestions, and if the GBA font's numbers are that all over the place (to which I agree) I could try to make them more consistent. 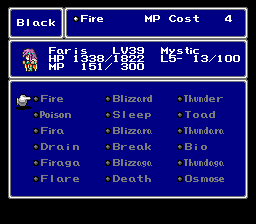 Do you prefer this font to the current, FF4 - styled font? And if so, do you have any other suggestions for improvement? If people generally prefer this font then I'll get to work checking the script for spacing errors and hopefully update it soon. 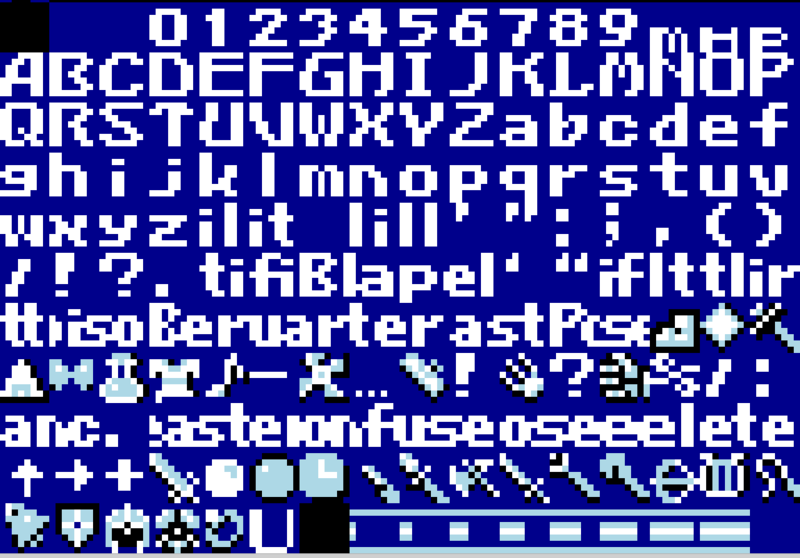 I'm not a big fan of the GBA fonts, to be honest. The current dialogue font you use looks alright. I'd like to do this, however I'm running into issues when it comes to space. Bear in mind my hacking knowledge is limited and I'll explain it as best I can. However, I am not able to use any of this space, which is unfortunate as the empty black spaces would be really useful. Say, for example, I replaced the text for the Fire spell with this symbol, hex 40. However, when I go into the game, it looks like this. The 'g' should be the symbol shown above. There should be a japanese character corresponding to the hex value 40 in the top box, as far as I know. No idea what's happening here, really. If I could somehow find a way to use some of this space I could easily update the relavent spell names. Unless you have any other ideas, of course. EDIT: Just submitted a poll for which font I should use. This gives me two choices - either forgo the -ra -ga spell system, or sacrifice some item icon tiles, possibly resulting in less clear/appealing item names. 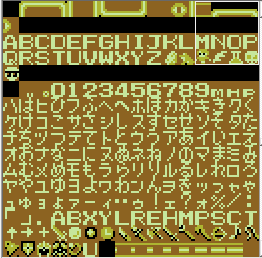 The thinner GBA font is nice, but might be a little more difficult to read on a CRT television. An update (v1.07) has just been submitted. This contains two optional patches - one containing bugfixes from slickproductions.org, the other a patch made by myself that makes Galuf's hair consistently ginger. The latter patch has also been submitted as a standalone download. An suggestion : Levia to Leviat. First wanted to say THANK YOU because the SNES version of this game is finally getting the refresh treatment it deserves just like the other 5 Nintendo Final Fantasy games have gotten. Wanted to know are you planning to add the ability to be able to dash without a having to have a thief in the party or using up an ability slot? Kinda how like they added it to the PS1 and GBA versions of the game? Something that I noticed when I made Namingway Edition is that you utilize more than you think. So you might want to look over everything you have name wise and perhaps redo what spell names are being changed in what way. I'm willing to help once I have some spare time. Currently I'm working on fixing up Woolsey Uncensored, and then I have a project I'm working on for my Youtube channel (I'm rather popular with my Transformers videos). I think the SNES FFIV styled font is great and it's uniform to the dialogue and menus, even if it's thin in the dialogue. 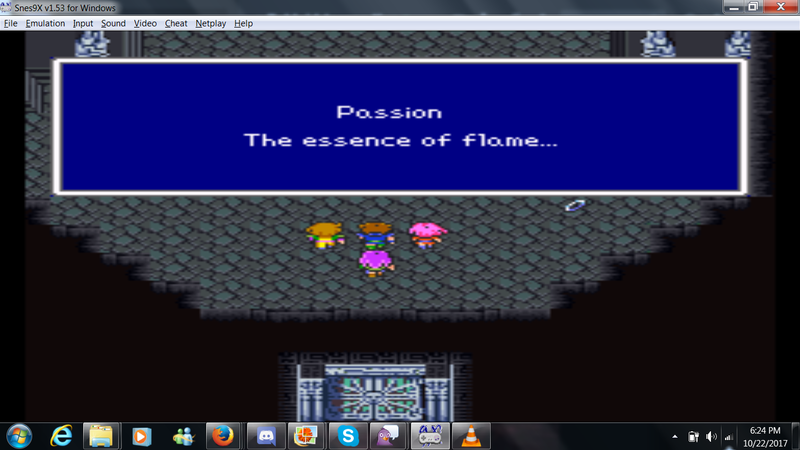 I don't care for the GBA or Earthbound styled font for Final Fantasy. I also think that you should change back the RPGe icons back to the original SNES ones. That's just a personal preference. 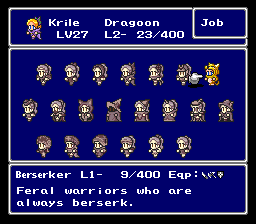 Don't know what that is - it's there in the RPGe fan translation (of which this hack is based on) as well. Leviat I can do. I'd like to add that, but my hacking knowledge is quite limited. If there's a way to edit jobs then maybe making Sprint an innate ability of all jobs is a possibility? I've tried to port as many spell names as I can. A few item icons have been sacrificed but nothing too drastic I think. Playing through this on my SNES classic and I love what you've done with the game. I'm at the end of the first world and I'm having a blast. Don't know what that is - it's there in the RPGe fan translation (of which this hack is based on) as well. Leviat I can do.I'd like to add that, but my hacking knowledge is quite limited. If there's a way to edit jobs then maybe making Sprint an innate ability of all jobs is a possibility? Fantastic! I knew you could do it. I don't think all of the added icons will be missed and I think restoring the original icons would be better as well. My first post here and it's for one of my favorite games of all time (And the version I've played the most). Really appreciate that you're doing this! I just started a run this evening and noticed this in the script. 'flame' is there in place of 'wind'. The update which adds the new squish tiles has just been submitted. While I'm here, I might as well shamelessy promote my other minor hack - a hack that changes Galuf's in-battle hair to ginger for consistency's sake. It's currently included as an extra optional patch with this hack. EDIT: The galuf hair hack was flagged as noncompliant, for some reason. EDIT 2: Seems as though it was considered redundant as I included it with this hack. Nice work! It's definitely great to have the new spell titles in. No sacrifices for Black Magic is great. I think in the Mobile version of V if you slide your finger away from the virtual D/Circe pad the character does walk a bit faster compared to if you keep your finger within the D/Circle pad then they do walk a bit slower. The GBA versions of V and VI have an option for auto dash in the config menu, and the PS1 version you could just hold down on the O Button but none of those versions allowed for dashing on the over world map and it's something that's toggled on or off on screen. 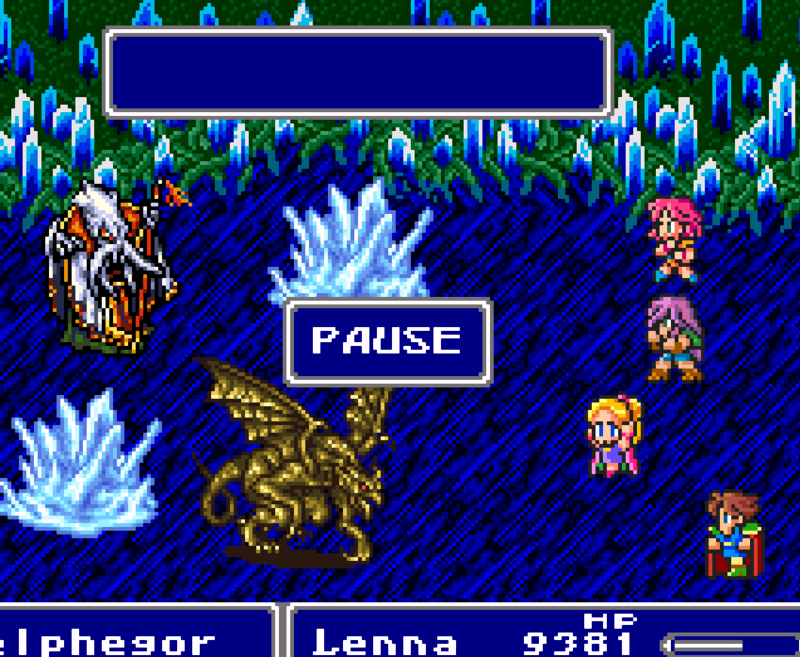 I guess FFV must handle its dash differently since you'r right it's not present in the IOS version VI. 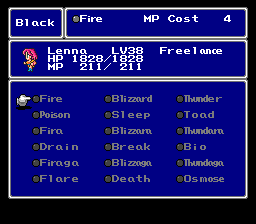 Submitted v1.11 - This version changes some monster/item names and restores some icons from the Japanese version (RPGe replaced some). The oversight Raijinken spotted has been fixed as well.